Vladimir Tarasenko scored his team-leading 11th goal for the St. Louis Blues in the first period at Montreal’s Bell Centre. 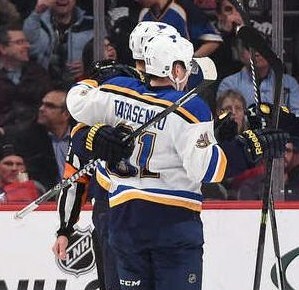 Tarasenko and linemates Jaden Schwartz and Jori Lehtera have scored 11 of the Blues’ 15 goals in eight road games this season. Nicknamed the “STL Line,” they have 14 goals and 36 points in their past 10 games. However, the rest of the team was shut down by Carey Price, as the Blues dropped their second in a row in a 4-1 final over the Canadiens. Max Pacioretty scored twice on his 26th birthday, by giving Montreal the lead by beating St. Louis goalie Jake Allen on a breakaway at 7:32 of the second period. He scored his second goal of the game, and team-leading 10th of the season, at 6:00 of the third period to put Montreal ahead 3-1.